Designed to encourage Christian men to live for Christ: in their homes, workplaces, leisure and in their churches. Has there ever been a more urgent time for Christian men to stand up and be counted? Family life is being systematically destroyed in our culture. Biblical Christianity is being undermined from within the historic denominations. The demands and insecurity of working life are increasing. 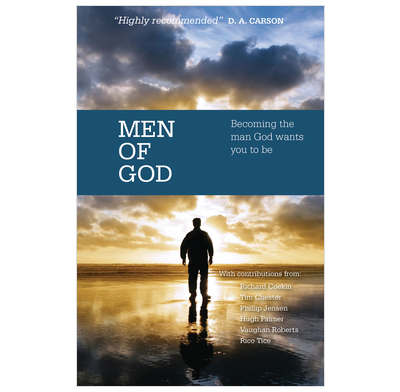 This book is designed to encourage Christian men to live for Christ: in their homes; in their workplaces; in their leisure; and in their churches. It is a resource for developing strong men's ministries in the local church which will lead to the mutual nurture, support and encouragement of men to keep going in our resolve to know Christ and to make Him known. Includes contributions from John Benton, Richard Coekin, Phillip Jensen, David Jackman, Hugh Palmer, Vaughan Roberts, William Taylor, Rico Tice, John Tindall, Trevor Archer & Tim Thornborough. With men being tugged in so many directions these days, it is a pleasure to recommend a book that faithfully reflects so much Scripture and that presents the application of that Scripture in faithful and sensible ways. That the book is set up as the sort of thing that could be used in small groups of men is an added bonus. Highly recommended. The contemporary confusion about manhood and masculinity betrays even deeper confusions. This becomes clear when you consider the desperate need for the recovery of biblical manhood in contemporary Christianity. That is why Men of God: Becoming the Man God Wants You to Be is so important. This book contains timely and faithful advice that both individuals and churches will find helpful. This material is excellent. Whereas much of what is written for men is either simplistic or moralistic, Men of God is thorough, Biblical, and gospel-saturated. It speaks directly to men and offers guidance and hope in the many different arenas in which their discipleship is played out.